Stop number four on my Independent Booksellers Week bookshop crawl took me underground. I'd walked around this area before and - looking up at shop fronts - failed to find Skoob, which is (admittedly not very) hidden down a pedestrian area, with an unassuming entry way that opens to steps down to this underground treasure trove. In fact, the only reason I found the bookshop this time (stupidly walking right past the large sign pointing the way) was because I spotted two women taking selfies outside the shop - one of the requirements of bookshop crawl participation. A welcome opportunity to compare bookshop stories and general bookish excitement, it was great to meet this pair and share in the excitement of finally visiting a destination that had heard of the IBW stickers intrepid bookshoppers were supposed to be seeking on their crawl (see book photograph). 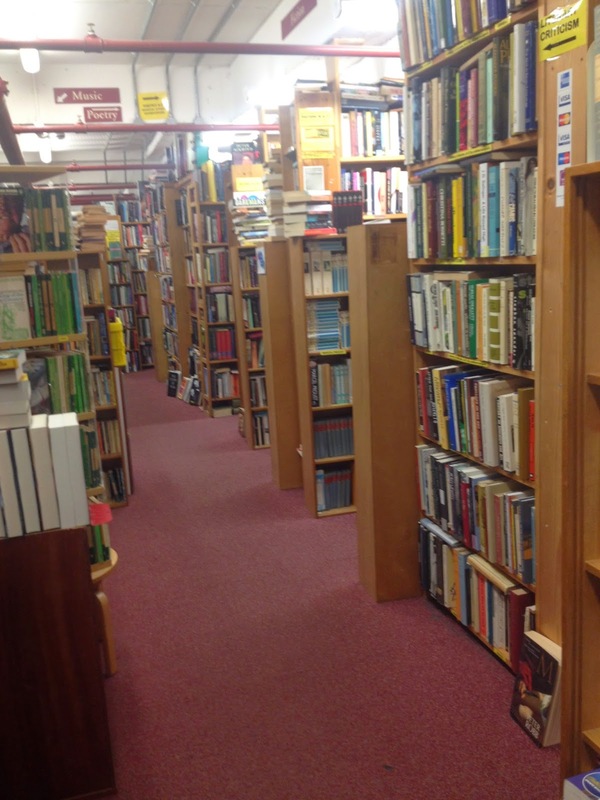 Buoyed by the meeting, I skipped down the steps and into the maze of secondhand books below. Being underground means Skoob opens up into a much larger space than you'd anticipate. With lots of nooks to get lost in, and scattered office chairs which I initially wondered at until I found myself utilising one for more comfortable perusal of the lowest of the bookshelves. 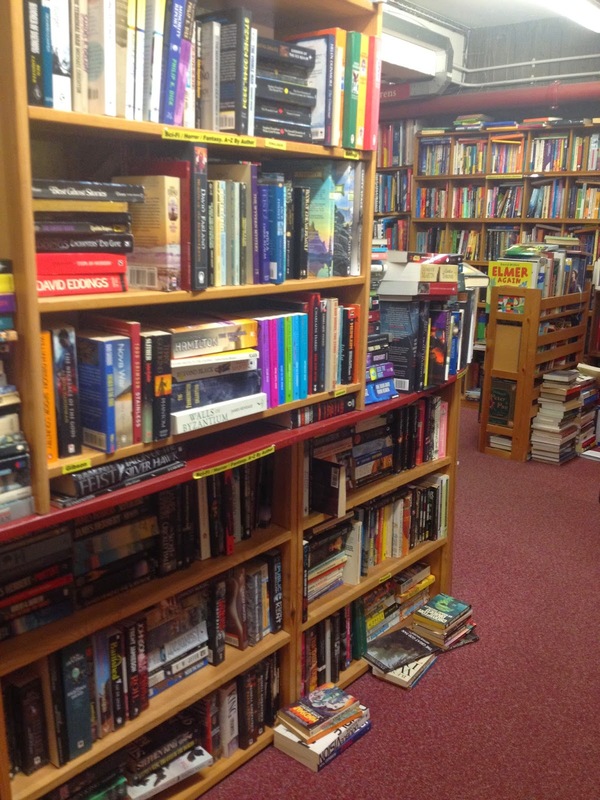 Just the right level of busy, there was a buzz to the shop as I weaved between the shelves passing all manner of subjects and collections - including a Penguin orange-filled bookcase - before lighting on the large science fiction section (to my mind the jewel of all secondhand bookshops). It was while browsing here and delighting at the selection that I was able to further take in the atmosphere: snippets of conversation, interesting people, and marvelling at the patience of the bookseller as a loud woman declared she'd visited with the hope of finding a cheap book here because "it's more than £100 on Am****" as though rudely assuming the bookseller wouldn't know the quality of his stock. 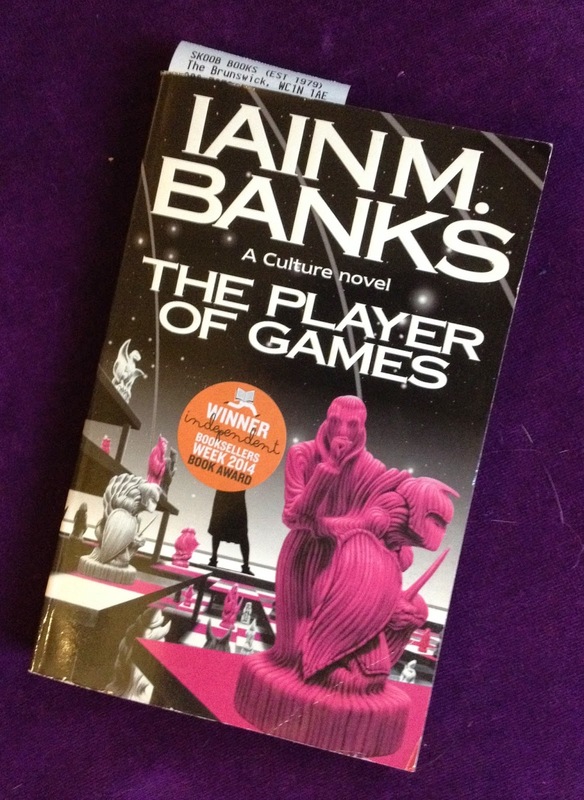 Picking up Iain M Banks' The Player of Games and heading to the till I was impressed such a conversation hadn't ruined the booksellers' mood as he kindly checked online to see if I'd selected the correct book in the series. Cue a fascinating conversation about books and the bookshop, followed by a quick check I hadn't taken any pictures of browsers for this blog - they feel very seriously about the privacy of their customers and have a great reason for this, which I'm sure the bookseller will explain if you ask about historic bookshoppers when you visit. And should you need further encouragement – there's a piano too. 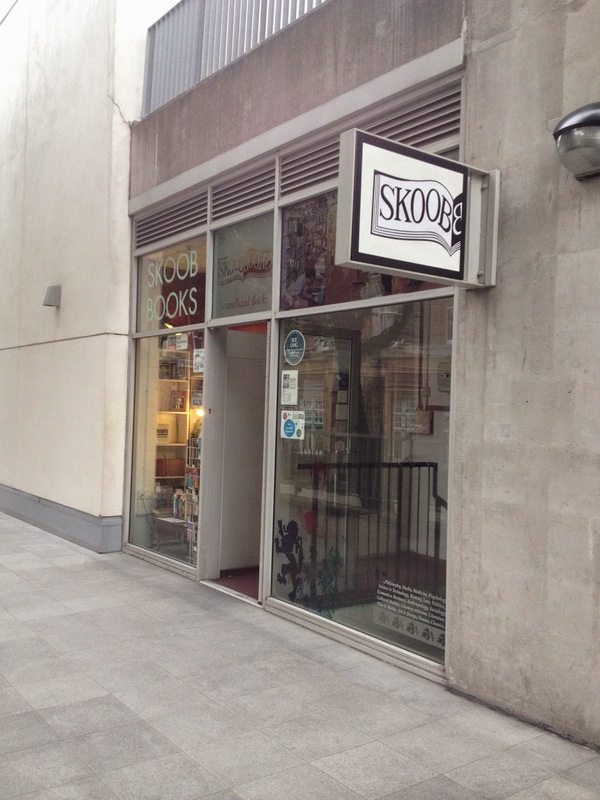 Skoobs is another very dangerous shop that used to be on my walk home! There are very few things I miss about living in the London area but that shop is one of them - you could get lost in there for hours. My husband and I would meet there after work - it was a great place for a date! I don't miss the job - that was a nightmare, hence the move to the South West. And Bath has it's compensations - you have to come and visit our wonderful bookshops sometime. But leave plenty of time - between the new and the second hand ones, there are a few to get to! I'm determined to get there sometime soon, but I might have to prioritise and arrange a couple of short visits instead. Oh! I'm so jealous of you for working this close to Skoob. I'd lose every lunch break buying books if I was in your situation. Heaven.